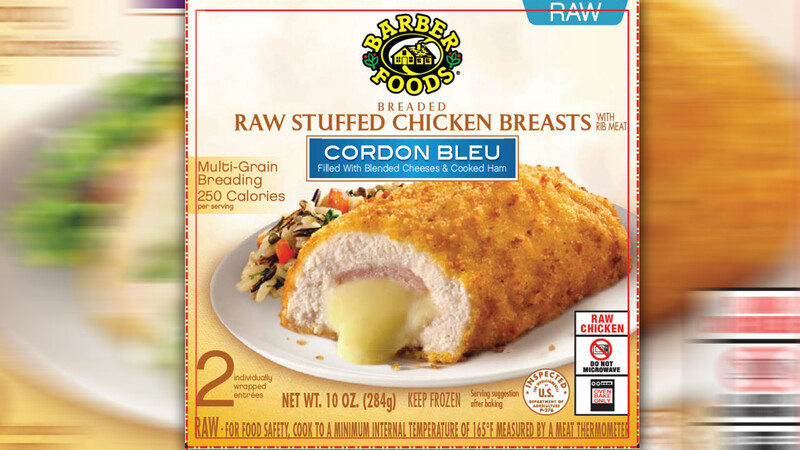 Barber Foods is recalling more than 1.7 million pounds of frozen, stuffed chicken products that may be contaminated with salmonella. The recall involves frozen, stuffed, raw chicken packaged in 6 individual pouches per box, in varieties including Chicken Kiev, Chicken Cordon Bleu, Chicken Tenders and Chicken Broccoli Cheese. The USDA says at least six people have gotten sick after eating the products between April and late June. The packages were manufactured between February 17 and May 20, 2015 and were sold at supermarkets across the United States, including Shoprite, Giant, Pathmark, Acme and Super Fresh.